In observance of the 60th anniversary of the Series 7 chair, furniture manufacturer Fritz Hansen enlisted seven architects to re-envision the classic Arne Jacobsen design. Explaining the impetus behind the program, Jacob Holm, CEO of Fritz Hansen, said, "If we fall asleep on top of our heritage, design becomes museum items. And if that happens, it (design) no longer adds new value to the present time." The participating firms—BIG, Snøhetta, Zaha Hadid, Jean Nouvel, Neri & Hu, Jun Igarashi, and Carlos Ott in association with Carlos Ponce de Léon—certainly created some eye-opening interpretations of the chair. The architects' comments on their designs reveal their inspirations and intentions. 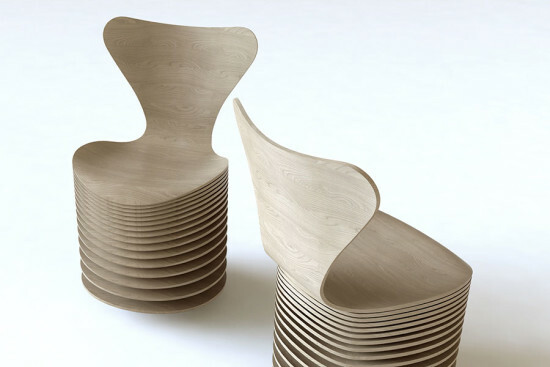 Bjarke Ingels Group "The inspiration for the design is the materiality of the chair, the essence of the layered veneer and the functionality of the stacking. The final result is a subtle repetition of the iconic form language." Neri & Hu Design & Research Office "The idea of a replica, a re-edition, hinges on the duality between the original and the re-design. Our take on this project is to embrace this exact idea of duality and create an actual 'double'. The doubling of two original seats facing each other becomes the new version: The singular chair multiplied as the individual becomes a community. Reminding us that we are never alone, but always together." Jean Nouvel Design "Our chair is an example of Jean Nouvel's design signatures: contrasting colors and juxtapositions. Black and white mark each chair—although they still play together in a feminine and masculine flow. Creating a reinforcement of the curves of the front and of the back of the shell." Zaha Hadid "The provision for this chair was to create a harmonic transition from the existing shell and how it can effortlessly touch down on the ground. This special edition formalizes the Series 7 chair as a dynamic and seamless expression of structure and support. Formed from two continuous steel rods, the sculptural base sweeps down to the ground and reaches up to embrace the undulating shape of the iconic plywood seat." Jun Igarashi Architects "When buildings collapse during earthquakes, the building materials are wasted. Our idea is to collect the waste wood, introduce a color and process it into boards that can be used for furniture." Carlos Ott Architects in association with Carlos Ponce de Léon Architects "The chairs have been intervened the same way a vertical garden grows organically up a wall. The upholstery climbs and settles peacefully on the shell of the chair. The curved lines which compose the foundation of the different areas in the garden are mimicked and adapted to the anatomy of the chair". Snøhetta "We nurture differences. When opposites meets, they conjure an interesting dialogue. When nature meets the cultivated, when humans interact with architecture, when soft and hard co-exist—interesting things happen. "Maybe the Series 7 chair with its metal legs and wooden seat acknowledges this juxtaposition. We wanted to explore the soft side of the chair. "The wood is a representation of softness in contrast to metal. A legless construction is free and indeterminate. It is versatile and simple. And maybe it can be a symbol for social interaction and playfulness. If we add even more softness to it we might be able to create a new user experience, additional functionality. We want it to be a multifunctional social tool in both singular and plural contexts. You can sit in any formation dictated by any social scene you are in. It can be a singular, free, soft chair or a plural one in a fixed social situation." The chairs will travel to design festivals in London, Copenhagen, and Gent, Belgium before being auctioned to benefit UNICEF. Hospitality design is all about visual impact and physical comfort. From pedigreed modernist classics to eye-popping contemporary works, these pieces will make any lobby or lounge area a memorable space. 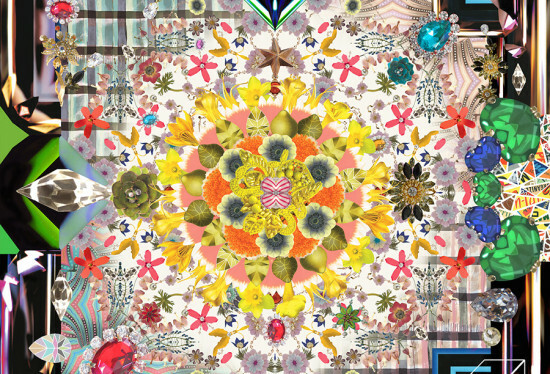 Jewels Garden Carpet (pictured at top) Moooi Fabricated using the Chromojet high-definition printer, which creates remarkably realistic images, this flamboyant collage of flowers, gemstones, and Madras motifs is definitely lobby-worthy. Designed by Sacha Walckhoff, Christain Lacroix Maison. Toa Ligne Roset The origami-inspired form of this cushy chair can be upholstered in leather for formal settings or cotton or wool for more casual decors. Ash frame, in natural or black stain. Designed by Rémi Bouhaniche. Air Sofa Luteca Its form inspired by structural I-beams, the frame of this sofa appears to float above the floor. Available in eight colors of leather upholstery. Designed by Alexander Andersson. Mixi Modular Watermark Cabinet Fringe Studio The Mixi Modular Watermark Cabinet is a chest of drawers with custom dark brass finished drawer hardware and a corresponding steel base. Mixing the old with the modern, this piece is finished with a printing process that runs fluid across the cabinet in a marbleized vintage book design. Series 7 Chair, 60th Anniversary Edition Republic of Fritz Hansen To mark the sixtieth anniversary of the Series 7™ chair, two special editions of the 3107 chair have been made. The chairs have been created with a masculine or feminine perspective: one with a dark blue shell with powder-coated legs, while the other features a pale pink shell with gold-plated legs. Each piece comes with a golden plate mounted on the bottom of the shell, documenting it as part of the limited release. Available only throughout 2015. Designed by Arne Jacobsen. Roundabout Lina Roundabout is a modular composition of seats/poufs that can be converted into bar stools, coffee tables, or chairs. Attached to one another by flexible joints, these elements can be composed into various compositions without limitation, in rows or clusters that fit in narrow halls or wide spaces. Smart joint elements on the poufs enable rotating one piece around another. Suitable for public places, offices, hotel lobbies or galleries, the collection is made of plywood, fabric covers, and high-density foam.